of years ago in our September garden. bits and pieces over the years. shady on a perfect September day. We layered the table with linens and lace. 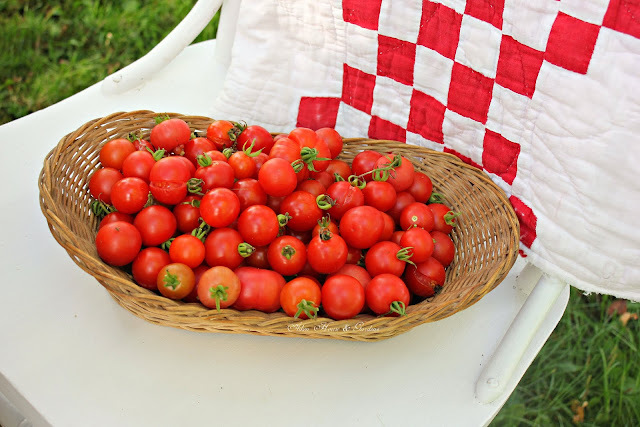 We had a great harvest of cherry tomatoes. late summer lunch in the garden. Delightful!! !Love the tablecloths,especially the crocheted one.That porcelain set is wonderful,one of my favorites...Your flowers bouquet is stunning!Always a pleasure visiting your blog! So cheery! I love the way you have layered the linens on the table! Just a beautiful setting. Happy September days! Hello, Carolyn, I just recently found your blog so this is the first post of yours that I have seen. I am hooked, your garden is lovely the table scapes are beautiful.I can see myself sitting for a light lunch and tea at your beautiful decorated table. Thank you for a nice daydream and thank you for sharing. That is beautiful! I love how you layered the tablecloths! Your flowers bouquet is stunning!Always a pleasure visiting your blog! A breath of fresh air from your lovely September table. The reds really pop and give a feeling of fall, but the beautiful sunshine adds a warmth to your pictures. At first I thought there were strawberries in the basket and my mouth was watering at the thought of biscuits and strawberries for tea. You always have such lovely posts! Hope you are all well and have a wonderful autumn. This is a beautiful post. Love your tablecloths, the dishes and the scenery. Also the food looks so yummy, especially the bread. Happy Fall.